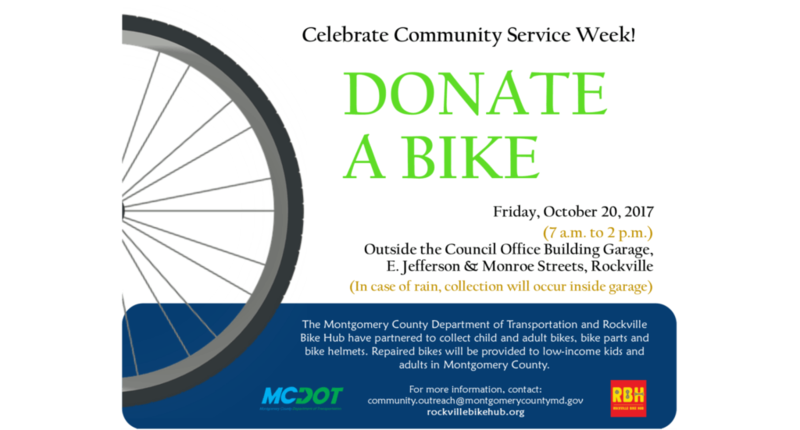 As part of Community Service Week, the Montgomery County Department of Transportation (MCDOT) is sponsoring a bicycle donation event on Friday, October 20 from 7 a.m. to 2 p.m. outside of the Council Office Building (COB) parking garage, located at the intersection of East Jefferson and Monroe streets, Rockville. Used bicycles, bicycle parts and bike helmets will be accepted for donation to Rockville Bike Hub, a non-profit organization whose volunteers refurbish the bikes and then donate them to low-income residents in the County, including Rockville’s Terrific Kids program and participants in the County’s Linkages to Learning program. Drop off one or more used bikes in any condition, bike parts or helmets to the COB parking garage (next to the gas pumps). Donate by check to Rockville Bike Hub during the collection. Donated funds will be used to purchase bike helmets and parts to repair the bikes.